Wooden Knick Knack Shelf. (c) 2007 Chris Baylor licensed to About.com, Inc.
Everyone has a number of prized possessions that could be considered as knick knacks: trophies, china plates, statuettes of animals, dragons, wizards or angels, or any kind of mementos acquired on a special vacation. No matter what type of sentimental items you prefer, you need an appropriate way to display these items. 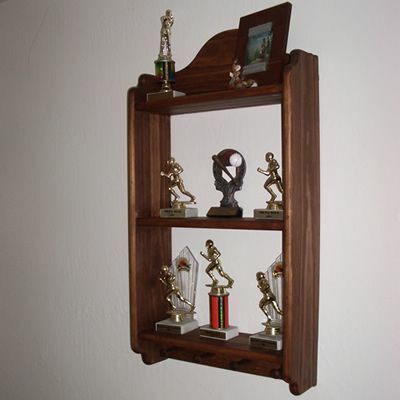 Frankly, there is no better way to display your collectibles as well as show off your woodworking skills than with a wooden knick knack shelf. In these free woodworking plans, we walk you step-by-step through building just such a shelf. While the unit is relatively basic, using very few mechanical fasteners, it is a fun project to build, and will show off your knick knacks as well as your woodworking skills. These free knick knack shelf plans can be built using pretty much any species of wood of your choosing. However, the unit requires some shaker pegs below the bottom shelf, so if you plan to buy the pegs rather than turn them yourself on a woodworking lathe, you'll want to use the same variety of wood stock for the shelves and standards as the pegs. Download the to build this knick knack shelf (PDF). Mark Curves with Compass. (c) 2007 Chris Baylor licensed to About.com, Inc. The first step in building these free woodworking plans is to cut the stock to length. As outlined in the step-by-step plans, you'll need one piece of 1x8 at 16-inches, three pieces of 1x6 at 16-inches (ripped to a 5-inch width on your table saw), one more 16-inch long piece ripped to 2-1/4" and two pieces at 28-1/4" long ripped to 5" width for the standards. Next, using a compass, mark the curves as noted in the plans. You be making some curved cuts with your band saw or jig saw in the top-back and the two shelf standards, so mark the curves according to the plans with your compass. Cut the Curves. (c) 2007 Chris Baylor licensed to About.com, Inc.
Once you have marked the curves on the top-back piece and the two sides, you'll want to cut the curves with your band saw or jig saw. Cut the curves just shy of the lines you marked, so you can clean the cuts to the line with your sander. The best way to sand the curves would be with an oscillating spindle sander, but if you don't have access to one of these specialty sanders, you can accomplish nearly the same thing with a spindle sanding attachment on your drill press or power drill. Sand the curved cuts to the marks you made in the previous step. Cut the Dadoes in the Shelves. (c) 2007 Chris Baylor licensed to About.com, Inc.
Once the curves have been cut and sanded, we'll cut the dadoes in the shelf standards. These dadoes do not cut all the way through the front of the shelf standards, as there is a more attractive option. Instead, we'll stop the dadoes about 1/2" shy of the front edge. To accommodate this stopped dado, we'll notch the sides of the shelves in a subsequent step. The preferred way to cut these dadoes is with a stacked dado set in a radial arm saw, set to a 3/4" width and 3/8" depth. One dado will be cut centered on the center line of the side standards, the edge of which is 13-3/4" from the top and bottom of the side pieces. The other two dadoes are cut three inches from the bottom and top of the side standards respectively. If using a stacked dado set on a radial arm saw is not an option, you could also utilize a 3/4" straight-cutting bit in a router to cut the dadoes. Be certain to install a straight-edge to guide the router, and make shallow, progressive cuts until the desired 3/8" depth is reached to avoid burning the bit or the wood. Finally, before we move on, we need to make some rabbets to accommodate the top-back and bottom-back pieces. These rabbets should extend down the inside-back edges of the standards, from the top shelf dado up to the top of the standard, and again from the bottom of the bottom shelf dado, down to the bottom of the standard. The best way to make these rabbets is with your router table, making certain not to extend the cut beyond the dadoes, as this mistake would be quite visible in the finished product. Round Over the Edges. (c) 2007 Chris Baylor licensed to About.com, Inc.
To give a finished look to the entire assembly, we'll want to round over the exposed edges of the pieces. You can use pretty much any profile router bit you choose, but I prefer to use a portion of a 3/4" roundover bit with a bearing on the tip. Using this partial profile will give a nice, finished look to the piece. Begin by rounding over the front edges of the three shelves. Make two passes through the router table, once with the top against the table and again with the bottom of the shelf against the table. Next, apply the same treatment to the all sides of the shelf standards EXCEPT the back of the standards, as the backs will be against the wall when the knick knack shelf is mounted. Once again, apply the edge treatment to both sides of the standards. Finally, apply the roundover treatment to the top and bottom back pieces, but front sides only. Once again, the back sides will be against the wall, and should not be rounded over. Cut Notches in Shelves. (c) 2007 Chris Baylor licensed to About.com, Inc.
Before we can begin assembly, we need to cut some notches in each side of the shelves. While the notches will be 3/8" wide, the length of the notches will depend on the method used to create the dadoes. The purpose of the notches is to allow the shelves to seat properly all the way to the bottom of the dadoes. For instance, if you used a stacked dado set on a radial arm saw to create the dadoes, you'll likely need a longer notch than if you used a router. If you used the stacked dado set, your notch may be as much as 1-1/4" long, as opposed to the notch necessary if the dadoes were created with a router will be as little as 3/8". To cut the notches, use a fence on your band saw to set the 3/8" width and cut a notch in the each of the sides of the shelves, cutting from the front with length as noted above. Sand the Pieces. (c) 2007 Chris Baylor licensed to About.com, Inc.
Before we assemble the parts of these free woodworking plans, it would be a good idea to sand all of the parts. It will be much more difficult to sand after the knick knack shelf is assembled. Use your random orbital sander with a progressively finer series of sanding discs and finish with a hand sanding for a perfect finish. Assemble and Clamp the Shelves. (c) 2007 Chris Baylor licensed to About.com, Inc.
With all of the parts sanded, it's time for the assembly step of these free woodworking plans. You'll need a few large clamps, some woodworking glue and a few finish nails to complete the assembly of the knick knack shelf. Apply a thin layer of woodworking glue into the dadoes of one of the shelf standards and insert the three shelves with their backs flush with the back of the standard. When all three are inserted properly, apply some glue to the three dadoes of the other standard and insert the shelves in these dadoes as well. Lay the unit with the front facing downward on your table. Place a small amount of glue in the rabbets at the top and bottom of the standards, and place the top and bottom piece in the appropriate rabbets. Clamp the unit together with a few long clamps to hold the standards to the shelves while the glue dries. Cross measure across opposite corners to make certain that the unit is square. Using a clean, damp cloth, wipe off any excess glue that may have seeped out of the joints. Tack two finish nails through each side the top and bottom pieces into the standards. This will help hold the knick knack shelf together while the glue dries as well. Install the Shaker Pegs. (c) 2007 Chris Baylor licensed to About.com, Inc.
A unique feature of these free knick knack shelf plans is the addition of four Shaker Pegs at on the bottom of the unit. These pegs can be used to hang garments, ribbons or any number of things. While you can turn some pegs on a lathe, you can just as easily buy some pre-made pegs. If you can't find any locally, try this online resource for wooden shaker pegs. Drill four holes evenly spaced across the bottom back piece, 1-1/2" up from the bottom. Place a bit of glue on the pins of the shaker pegs and install them in the four holes of the back. Allow the glue to dry. Finish the Knick Knack Shelf. (c) 2007 Chris Baylor licensed to About.com, Inc. The final step to these free woodworking plans is to apply the finish to the unit. You may choose any finish you wish, be it paint, stain, varnish or shellac. If you choose to stain the unit, as we have done in the picture on this page, you'll want to apply a few coats of polyurethane to the unit to protect the finish. Be sure to give the finish a light sanding between polyurethane coats. The only thing that remains is to hang the unit. You may use any type of hardware you feel appropriate. I used a couple of D-ring hooks attached to the standards in the back of the unit, hung on two level screws in the wall. The width of the knick knack shelf design should allow each screw to be sunk into a stud for strength.